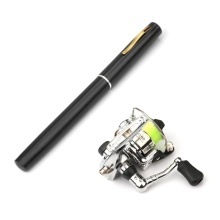 You can enjoy fishing soon with this prepared fishing reel and rod combo. Only 8.0in in collapsed length to fit in your pocket or fishing tackle. Glass steel fiber rod, solid and strong, free to fight with big game fish. You will be surprise by this mini fishing reel and rod kit. Reel & Rod Combos: Enjoy fishing soon with this prepared fishing reel and rod combo. Fishing Rod: Glass steel fiber rod, solid and strong to fight with big fish, and aluminum alloy shell, corrosion resistant and lightweight. Fishing Reel: Mini spinning reel with fishing line, 4.3:1 gear ratio, 2+1BB with copper axis for smooth and easy operation. Designed for Fishing: Only 9.8oz, lightweight for easy transparent, and 8.0in in collapses length to fit in your pocket or fishing tackle, working well in freshwater and saltwater.